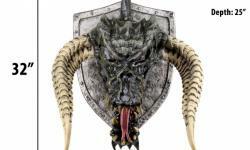 WizKids has unveiled the latest addition to its impressive collection of foam replicas with the Dungeons & Dragons Black Dragon Trophy Plaque. The Black Dragon was teased at New York Toy Fair earlier this year (see �'Magic: The Gathering' Minis, Massive 'D&D' Ship, Black Dragon Trophy�), and now the final version is being solicited for sale in January. The wall hanging measures 24� x 18� and extends 25� from the wall. It is a heavy object for its size, weighting approximately 14 � 16 pounds and requires a structural element for mounding that can support 2� x 4� wall studs, so WizKids recommends professional installation. The retail cost of the figure was not announced. Retailer may email WizKids for more information.